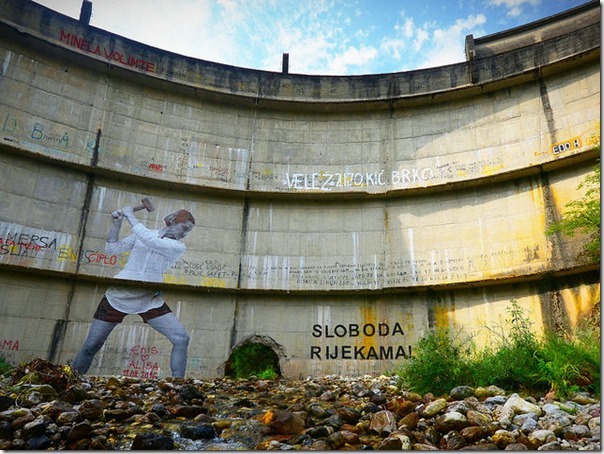 Conservation Murals: Freedom to the Rivers of Bosnia and Herzegovina!!! The Coalition for the Protection of Rivers of Bosnia and Herzegovina warns that the uncontrolled construction of hydropower plants will cause untold devastation to biodiversity and water quality in the country. More than 300 new hydropower plants are currently planned. “As the Bašćica River is free, we want all the rivers to be free. There are currently many battles against hydropower plants and local communities directly dependent on these rivers are ready to defend them by all means. Rivers are a common good, not the property of individuals. Putting private interests over the public by authorities should stop. This is a unified fight!” said Natasa Crnkovic from the Coalition for the Protection of Rivers of Bosnia and Herzegovina.